Hey, friends! Missy here again, and I have a fun Christmas layout to share today for Precious Remembrance Shop featuring the Sketchy Christmas Stamp Set. I was inspired by those cute trees and decided to make several embellishments out of them for my page. I began with a few different green ink pads and some scrap paper. I mixed and matched the inks to create different shades and tones of green. 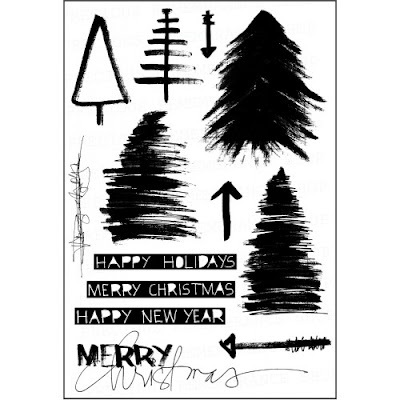 I used all three trees in the stamp set. I fussy cut them out and then arranged them around my photo, which is of my daughter at the Christmas tree lot last year. I decided to bring in some gold and pink to the background, so I used some spray inks and plastic packaging to create the watercolor look. I also added lots of splatters with the nozzles of the spray inks. I love how these trees turned out! I lightly spritzed them with gold spray ink before cutting them so it looks like gold snow. So sparkly and pretty! I layered them all together and popped a few of them up with adhesive foam. I also fussy cut some trees from some Crate Paper patterned paper to add some color to all that green. To finish it off, I tucked in some gold metallic thread. I used some alphas from an old Hip Kit Club kit to create some of the title. I also used a circle die cut from the Oh Christmas Bits & Pieces pack. I cut it in half and used half above the photo and half below. I added in some green thread and did a bit more mixing and matching with my title. I pulled in some older gold Thickers and some older washi tape. Here’s the other half of that circle die cut…so cute! I used an old 3×4 card from that Hip Kit as a layer here as well as more thread and some sequins from SpiegelMom Scraps. I'm obsessed with how these layered trees turned out! Look how pretty the gold looks in the light....ahhhhh. Gold Color Shine makes everything prettier :) I raised up the front two trees with some foam adhesive, and I think it makes all the difference. I mixed and matched my title with some chipboard alphas, some older Thickers and some washi tape. I love how it turned out! Here’s another tree cluster to the right of the photo. I love the depth and dimension created here. I wanted it to look like a little forest of trees, and I think I accomplished that. I hope this inspires you to pull out your Christmas stamps and create something festive! Be sure to check out my process video here to see how this all came together.